The Society of Botanical Artists had their Christmas meeting in London today. It is a time to meet other full members, associate members (those on the way to getting full membership) and Distant Learning Students. It is a good time to meet and talk about what people are doing and for me, the opportunity to mention a little about Palmengarten and what will happen when the exhibition finishes at the end of November. There is still the opportunity to go and see the exhibition in Frankfurt and it is worth seeing. I know that some SBA members are going to see it before it finishes. Today I am posting a picture from today’s informal meeting. It was taken while member Brenda Green was entertaining us. As you can see, we all enjoyed ourselves. More photos from the exhibition. I do hope that you are enjoying them. Ian Coulson preparing the table with the CV and visitor book. 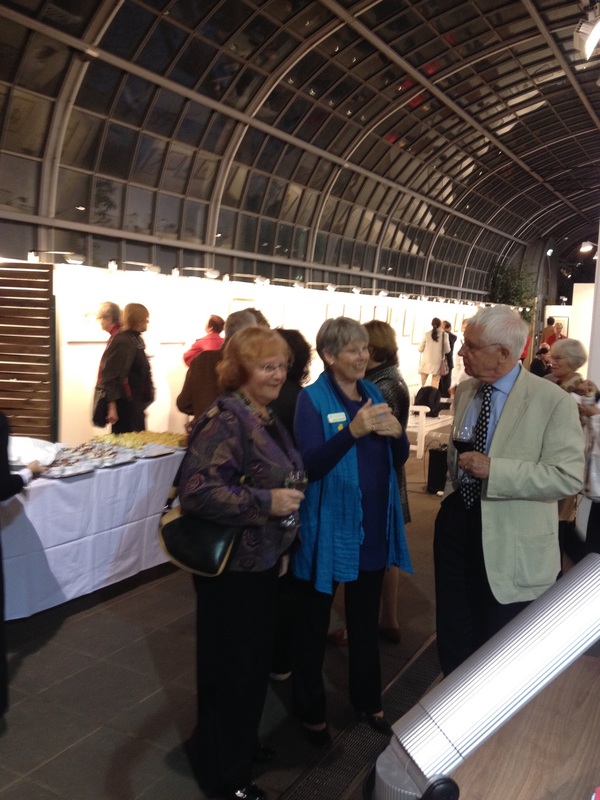 SBA member Alister Matthews at the opening in Frankfurt, with her husband. ( and me of course). So I notice when these paintings are framed, there is no color used on either the inner or outer mat. Is that a requirement of the show? Or just a choice by the individual artists not to take away any focus from their artwork? We are encouraged in the UK, to make sure that our framing and matting doesn’t take the viewer’s attention away from the picture. It is intended to enhance the artwork, not dominate it. This means that we are generally careful with both the frame style, colour and size. The matting also plays an important role in this. Many years ago I remember picking a colour for the matting that might be in the picture. Later on I used a double matting with the internal one in colour. Then a white double matting and now a single thick one. Of course I find the last much more stylish, but what one does is very much affected by fashion too. Another style of matting is a floating one. Billy Showell has used that quite a bit when framing her work. My husband is very disappointed in all this simplicity as he loves matting that has a wash line around.